In a world of iPhones, social media and e-mail, we are all in constant contact. Then why are so many people feeling burned out, distant from colleagues, and abandoned by family and friends? 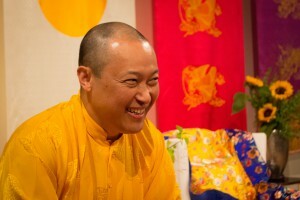 Cutting through all the white noise, chatter, and superficiality our cell phones and social media cause, the Sakyong Mipham Rinpoche, one of Tibet’s highest and most respected spiritual leaders, offers simple and practical advice to help us increase our attention span, become better listeners, and strive to appreciate the people around us. In this new book from the bestselling author of Running with the Mind of Meditation, the Sakyong uses the basic principles of the Shambhala tradition—meditation and a sincere belief in the inherent wisdom, compassion, and courage of all beings—to help readers to listen and speak more mindfully with loved ones, co-workers, strangers, and even ourselves. In Fall 2017, The Lost Art of Good Conversation Book Tour will take the Sakyong to three North American cities for live events: Denver, New York and Toronto. In each city, he will speak about one of the book topics in both a panel discussion with local leaders and a full-day workshop with host Lodro Rinzler and teachers Susan Piver, Ethan Nichtern, and Fleet Maull. Participate from the comfort of your own meditation cushion at home via The Cushion Tour: a six-week course that includes livestreams of each tour event. This interactive online event also features exclusive content such as behind-the-scenes footage and The Lost Art of Good Conversation teachings from the Sakyong, host Lodro Rinzler and all tour guest teachers.